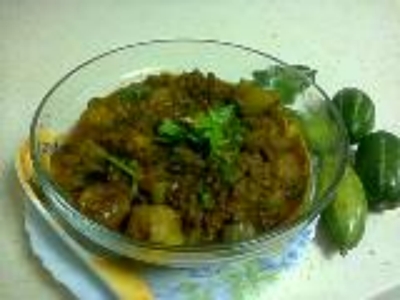 It is a spicy semi-dry preparation of parwal cooked with mutton mince. Instead of stuffing the keema in the parwals, as we do in potoler dorma, I tried out this way. It came out very well. Have it with naan/chapatti. For veg. version, you can use soya granules, mushrooms or rice. Heat 1 tbsp. oil and fry the chopped parwals till light brown. Keep aside. Heat remaining oil and temper with bay leaves and whole garam masala. Add the onion and saute till brown. Add the ginger-garlic paste, coriander-cummin powder, tomato paste, turmeric powder, chilli powder and garam masala powder mixed with little water. Fry till oil seperates from the sides of the pan. Add the mince and salt to taste and continue to fry till dry. Add the fried parwals, and 2 cups of water. Cook, covered on a low flame till the parwal is soft and the gravy is thick. When done add ghee and serve, garnished with coriander leaves.